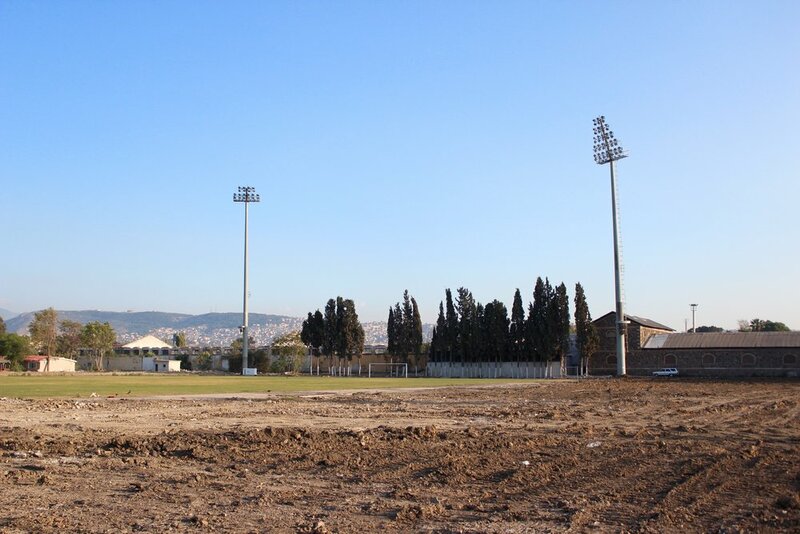 When I visited İzmir’s historic Alsancak Stadium in October 2015, only the floodlights, pitch and goalposts remained. The ground where the stands had stood had been raked and churned by the teeth of a huge machine. A man picked his way through clumps of earth, looking for something to salvage. Football has been played on the site of Alsancak Stadium since at least 1910, when a local Greek team, Panionios, owned the land. Founded by the ancient Greeks, İzmir was a cosmopolitan city then known as Smyrna. As in other major Ottoman ports, football was introduced to the city by the British in the late 19th century and was soon taken up by local Greeks, Armenians and Jews. Muslims were subject to a de-facto ban by the authorities under the autocratic Sultan Abdülhamid II, who was suspicious of the sport. In 1908 an uprising within the military, mostly led by the Turkish nationalist ‘Young Turks’, forced the sultan to cede powers and restore the more liberal 1876 constitution. It ushered in a more pluralistic era. The ban on Turkish Muslims playing football ended and the sport was increasingly seen as a way of promoting nascent Turkish nationalism. Karşıyaka S.K. was formed in İzmir in 1912 and took the colours of red and green to represent Turkey and Islam. Altay S.K. was formed in 1914 to encourage Turkish youth to play sport in the city – they would become the eventual owners of Alsancak Stadium, built in 1929. During Turkey’s War of Independence, the Turkish National Movement led by Mustafa Kemal (who became Turkey’s first president and later took the surname Atatürk – ‘Father Turk’), defeated Allied occupation troops to establish the Republic of Turkey. A few days after Mustafa Kemal’s Turkish army had driven Greek forces out of İzmir in 1922, a fire almost totally destroyed the Armenian and Greek quarters. How the fire started is disputed, but little was done to stop it. ‘Let it burn, let it crash down,’ responded Kemal. Panionios relocated to ‘New Smyrna’ in Athens to escape the mutual ethnic cleansing of Greek and Turkish communities in both countries – euphemistically called ‘population exchange’ – following the Greek army’s defeat. İzmir went from having an estimated non-Muslim population of 62 per cent in 1900 to 14 per cent by the late 1920s. This figure would dwindle further over subsequent decades. But Alsancak continued to be an important fixture in the city. In 1959 the stadium hosted the first ever game in Turkey’s national league, founded that year, between İzmirspor and Beykoz 1908. Several teams – including bitter rivals Göztepe and Karşıyaka – shared a home at Alsancak Stadium. Although creaking and decrepit, the stadium was a symbol of İzmir’s cosmopolitan footballing culture. The Justice and Development Party (AKP) – a conservative party with its roots in Islamism, co-founded by Turkey’s current president Recep Tayyip Erdoğan in 2001 – has been in power since 2002. It has partly built its hegemony through the construction sector. Football stadiums are a major component of this policy. In the past few years there have been at least 30 new stadium projects across 27 cities in Turkey. Football fans in İzmir feared that the AKP government would seek to capitalise on Alsancak’s prime location, following a trend in which old stadiums, traditionally built in city centres, have been demolished in favour of shopping malls – with new stadiums then built on the outskirts. Click here to read the rest of the article published by History Today.